Much like the cassette tape itself, shoegaze music has the distinction of surviving its own obsolescence. Though it’s recent re-emergence has been met with general surprise (and, just as in the 90s, critical acclaim), those most deeply invested in the scene the celebrates itself will gladly tell you it never went away. And while the renewed degree of hype behind the genre has given rise to a rash of uninspired, trend-hoppers, it’s also emboldened groups like Haunter to put something magical to tape. After a few records of reverb-tinged acoustic, the Wisconsin band plugged in their guitars for 2014’s murky, intimate self-titled EP. Haunter sounds formidable out of the box thanks to a lo-fi mix favoring John Schoneman’s drums. Alec Grefe, Erik Kersting, and Aidan Keyes’ guitars jangle and scream underneath a musky room reverb, with the former’s excellent vocals confidently commanding the listener’s attention in a way few other shoegaze singers manage. From the Duster-esque arpeggios on “June” to the screeching, Savilllian leads on “Breather,” it’s clear Haunter are no strangers to 90s indie. Ultimately, however, the slower pace and power-chord heavy arrangements suggest the contemporary sounds of scene shoegazers Whirr and Nothing. Whichever way you split the difference, Haunter make for an enjoyable listen – and if you’re the type that pays close attention to lyrics, Grefe’s unassuming musings on loneliness and love just might get you all emotional. 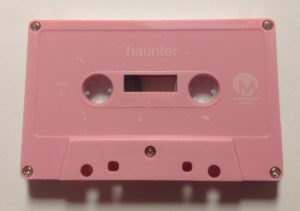 You can purchase the limited-run Haunter tape on Otherworldly Mystics from the label or directly from the band.